I discovered Géry Etuin in 2007, following his 1st National and 2nd International Irun with his IRUN MAN. 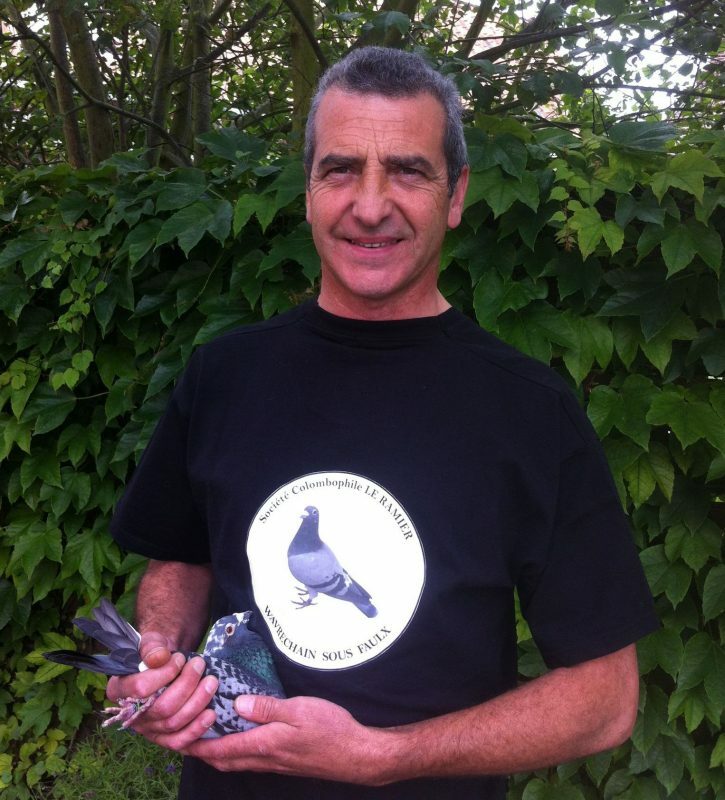 Coming from a family of pigeon fanciers, Géry started in pigeon racing in 1971 with his father, Emile. 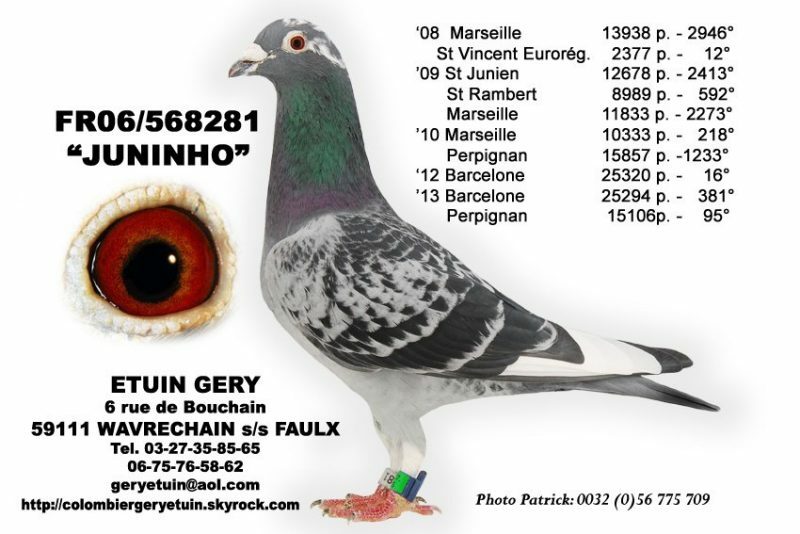 From 1988, Géry has flown on his own, first to Ramillies and Wavrechain under Faulx since 1992, a small village located between Cambrai and Valenciennes. At the beginning Géry played all the contests, but for his family life, Géry concluded an agreement with his wife to play about 10 weekends per season. From 1993 to 2001, Géry participated in speed events. In 2002, it is the orientation towards the long distance competitions and the international ones since 2004. It did not take long for Géry to become a sure value of international races. Since 2004, his boats are classified in the TOP 10 National. First of all with the Mitterand 2 from its ancient origins. In 2017, it is the 1st consecration, with its IRUN MAN (633-2005): 1st National and 2nd International Irun 2007 (15943 Old). Irun Man is a 2005 male. His father is 422296-1999, a late one directly to breeding. 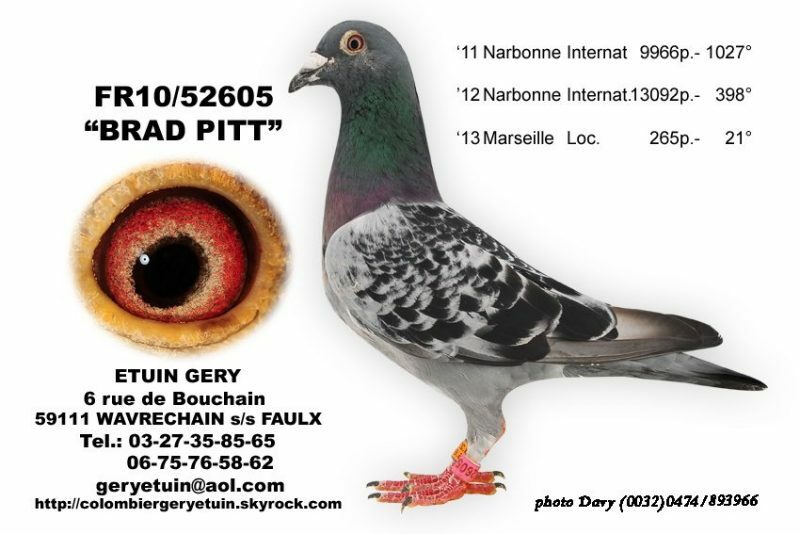 We find in the origins of the father Crack Liétard of 1984 and the 5149441-1991, the famous female Malfait who gave many excellent pigeons at Etuin’s loft. 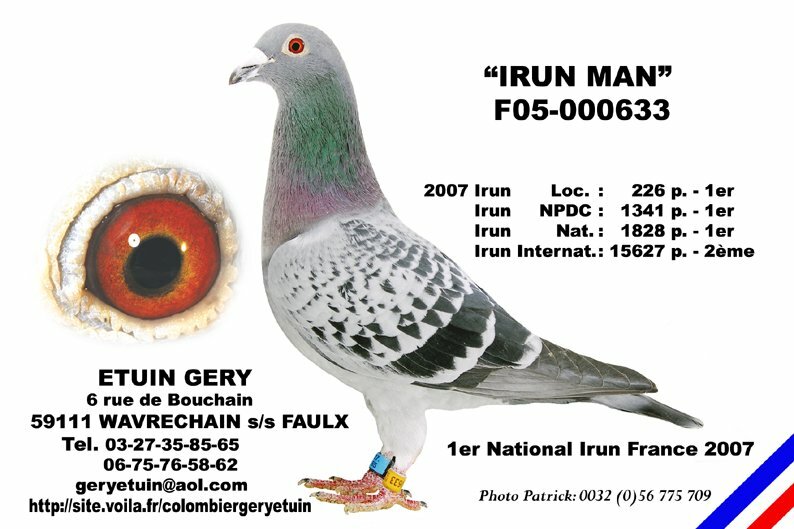 The mother of Irun Man (B2003-9157422) comes directly from the Thierry Sibille colony of Courcelles. 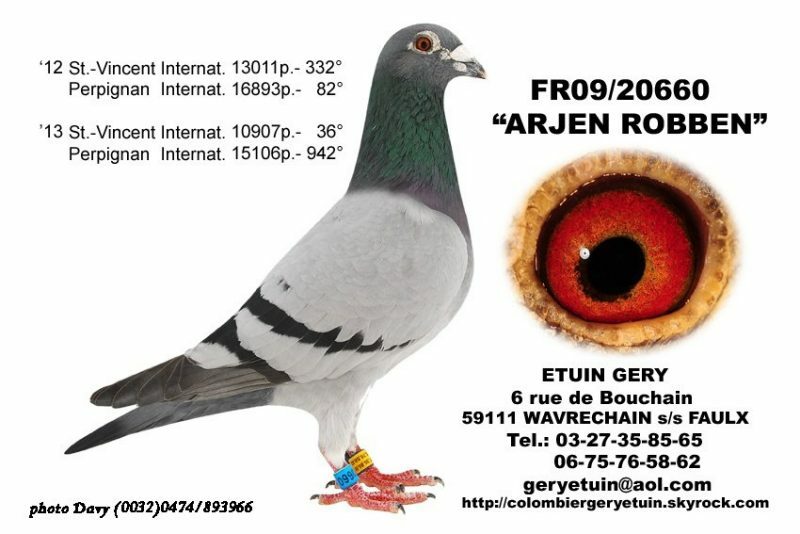 His father is a son of Castagnet mated to the sister of the 2nd International Bordeaux (Origin Marc Roosens). His mother is a 100% Kurvers De Weerd. Irun Man had already won in the 2007 season the 120 / 600p on Collégien, 331 / 1432p on Bourges and 287 / 1193p on Limoges before being basketed for Irun. 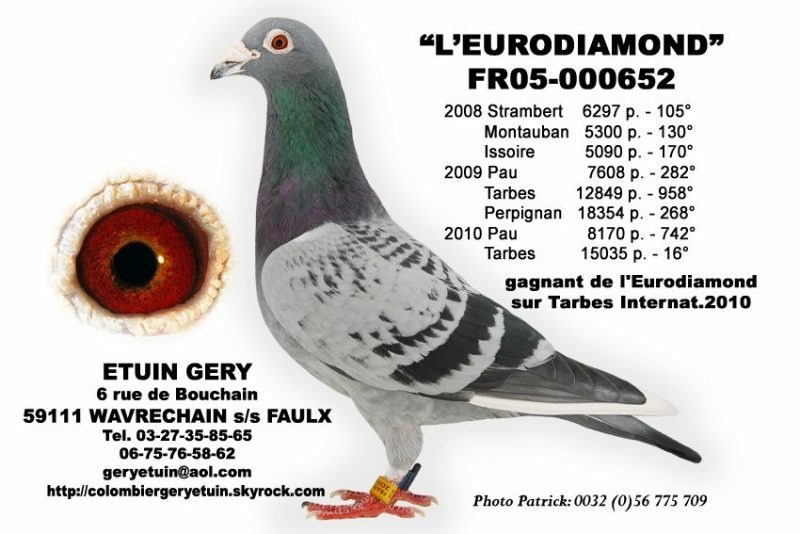 Winner of EURO DIAMOND PIGEON TARBES in 2010 with Eurodiamond. 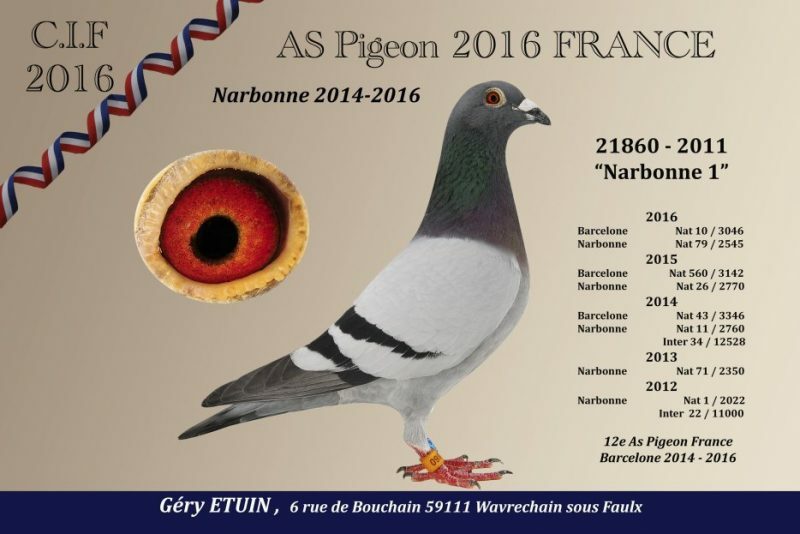 In 2011, Géry marks the spirits again on Narbonne Yearling by ranking 10 pigeons of 11 basketed with the 5th, 14th and 21st National and the 13th, 29th and 43rd International of 9966 pigeons. 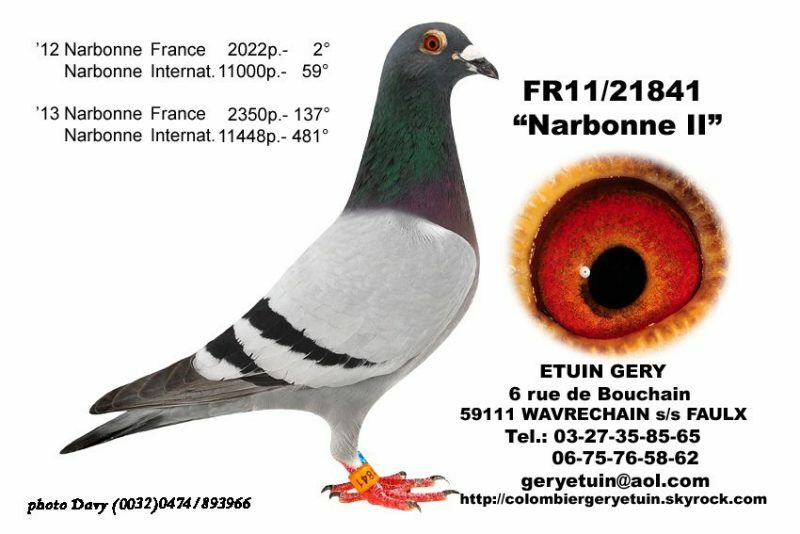 2012, after a 3rd National of Barcelona against 2900p, Géry sees his “Narbonne 1” bring him a second National victory over Narbonne and also wins on the same Narbonne the 2nd and 5th National. and winning no less than 7 TOP 100 National on Barcelona and Narbonne. 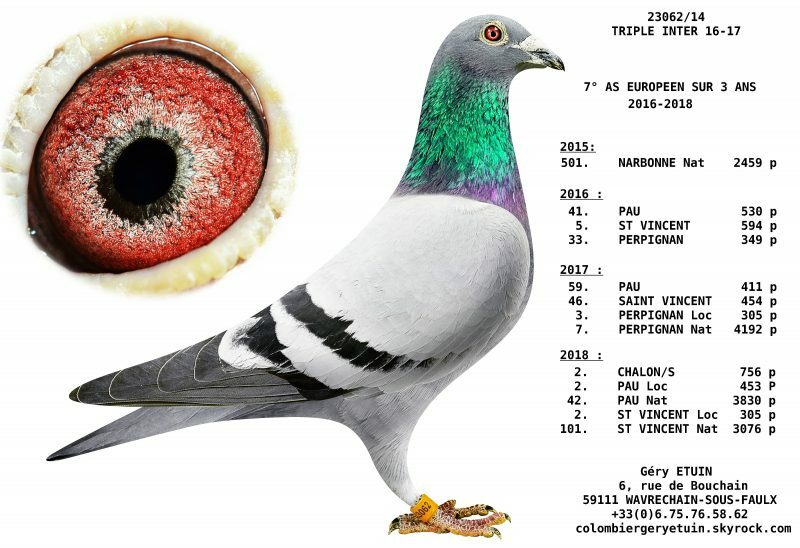 EURO DIAMOND PIGEON 2014 MARSEILLE, At the peak of his art, the best travelers were scattered at an auction at the dawn of the 2015 season. Auction remains to this day one of the best sales of a French amateur. 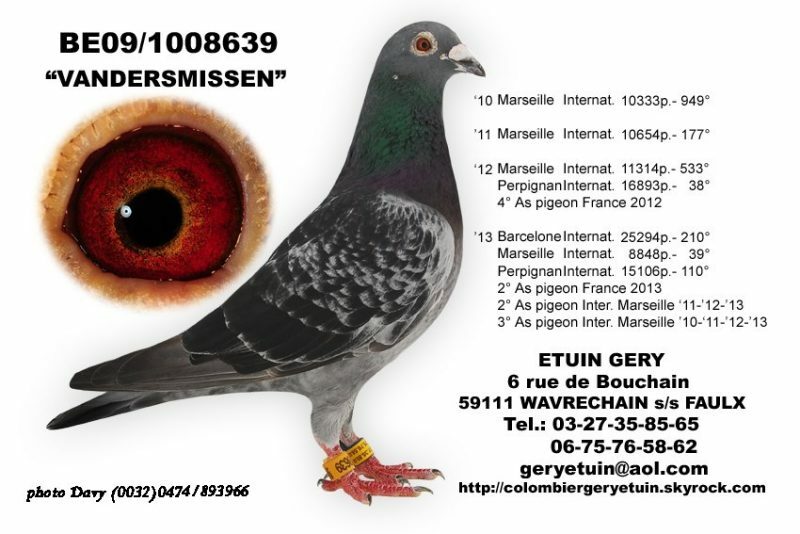 LE 335023-2015 is the result of a mating between Narbonne 1 and a girl from Vandermissen.